In the most anticipated match of Wednesday between Manchester City and Arsenal turned out to be one of the most boring match of the Premier League so far. The match ended up on a goalless draw, as none of the team were able to find their into turning something for their team. There were lots of boos and chants of 'boring boring City' by the Arsenal fans coming unleashing their criticism upon Mancini's team. Manchester City's manager was seen in a heated conversation with Captain Fabregas, as he was severly critical about his ultra-defensive techniques applied during the game nplay.Throughout the game, Arsenal on the other hand were severely frustrated as they were unable to break-through Joe Hart,Vincent Kompany, Kolo Toure and Micah Richards, who defied the Gunner's making any kind of room. They looked like a ostrich just trying to save his face, and not letting to face the music, and kept defensive throught out the 90 minutes of the game. City had the minimal of the attack , and Arsenal's Lukasz Fabianski had nothing much to do at all. 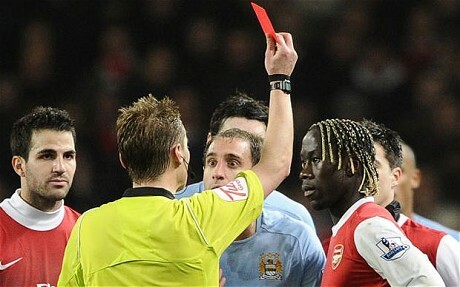 The only highlight of the match was the two reds that were distributed between Pablo Zabeleta and Bacary Sagna. Machester City overall topped with the bookings with one red , and other yellows going to De Jong and Barry. With this draw and City losing its winning points the only satisfied person would be Sir Alex Ferguson, who will be sittiing in a relax mode as they are well ahead now. But still City would be pretty satisfied as they were able to rectify their loss at Eastlands where they were ripped apart 3-0. Arsenal throughout the 90 minutes had been very quick with Alex Song, Walcott, Fabregas, Samir Nasri kept on operating intelligently behind Van Persie. Arsenal kept most of the possession with 61%, but City's defense was way too strong for them to break in.In order to stop the influx of Arsenal's strikers City also went on doing illfounded techniques to stop then with Barry catching up on and later De Jong doing some show to stop Wilshere. But were penalised for their attempts as well, but whatever the case, they denied all their chances.